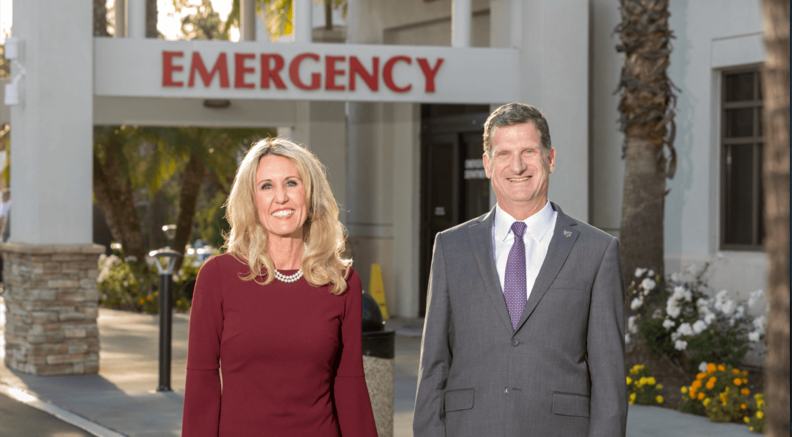 MemorialCare CFO Karen Testman, and John Cascell, senior vice president of managed care, pictured at MemorialCare Saddleback Medical Center in Laguna Hills, Calif., work with physicians to help them receive market rates from insurers. MemorialCare executive John Cascell believes physicians are privileged to be chosen to work in the system's hospitals and clinics. They're high-quality facilities that are well-respected in California's Orange and Los Angeles counties. That's why he stands behind the Fountain Valley, Calif.-based health system's long-standing policy of requiring in-hospital physician groups to contract with the same insurance carriers as MemorialCare. The provision became part of the system's contracts several years ago in response to patient complaints about receiving surprise bills. 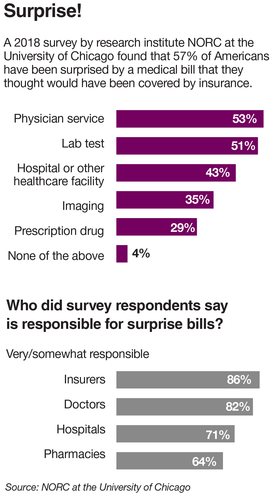 Among the myriad solutions proposed for the widespread problem of surprise medical bills, some industry insiders say simply requiring in-hospital physician groups to contract with the same insurers as the facilities they work in could go a long way. Such stipulations were commonplace decades ago, but some experts say the practice slipped out of favor around 2000 as major physician staffing companies—which tend to make more money when they're out of network—gained market power. When Rulon Stacey worked as a hospital administrator, he often let physician groups decline to participate with the same insurers as the hospital. He now thinks that was the wrong decision. Surprise billing is one of the few areas that could see bipartisan action in Washington, D.C. Last year, lawmakers on both sides of the aisle introduced bills to curb or at least minimize the impact of surprise bills. Perhaps the biggest downside with such a stipulation is that it tends to disadvantage physicians and hands a lot of negotiating leverage to insurers, especially if they know the physician group must contract with them as a condition of working in a certain hospital. To be fair to the physicians, some hospital administrators said their contracts have so-called reasonableness provisions that promise physicians won't be forced to accept less than market rates from insurers. Boca Raton (Fla.) Regional Hospital, which requires physician groups to contract with the same insurers as the hospital, is among those with such contract language. That provision might be used if, for example, a major insurer offered to pay only 10% of what Medicare pays for radiology services, said Dan Sacco, the hospital's vice president for strategic affairs and payer relations. Sacco said the hospital has not yet been in that situation. MemorialCare, which also has a reasonableness provision, will step in and help physicians in contract negotiations if necessary. "If a physician group is at an impasse with a payer, we would certainly do what we could to help move along the process," MemorialCare Chief Financial Officer Karen Testman said in an email. Still, these types of provisions are tricky when dealing with national physician groups like Envision Healthcare's EmCare, which provides physician staffing for emergency rooms and inpatient areas of hospitals. Les Hirsch, CEO of St. Peter's Healthcare System in New Brunswick, N.J., said his system's contracts require physicians to have the same in-network insurers, but has still had problems with EmCare being in-network with some insurers, despite having contracts that require it. “The ability to actually implement that 100% of the time does become a challenge,” Hirsch said. In situations like that, Hirsch said St. Peter's maintains an active dialogue to ensure its patients aren't getting surprise bills, a problem he said he hears few complaints about. New Jersey's new law designed to protect patients from surprise bills will likely further reduce that risk, Hirsch said. The law, which took effect last summer, requires providers to tell patients before scheduling an appointment whether they are in or out of network and to disclose all costs the patient is likely to incur from the procedure. It's a good practice for health systems to warn patients via signage or other means that various providers involved in their care could be out of network with their insurance company, Sékaran said. But he doesn't recommend health systems name specific providers that are out of network. Not all hospitals will be able to successfully require their in-hospital physicians to contract with the same insurance carriers, especially if they lack negotiating strength. Particularly in rural areas, some hospitals may not have many options for physician staffing groups. On the flip side, some physician groups may find it imperative to contract with the only hospital in town. One thing everyone agrees on, Miller said: Consumers are getting caught in the crossfire. “They are sort of the innocent bystanders in this,” he said. Administrators from hospitals that have added such rules said patient complaints pushed them to make the change. MemorialCare's Cascell said even though hospitals in California aren't allowed to employ physicians, patients still tend to connect the bill they receive from physicians to the hospital, because that's where they received the care. It was calls from unhappy customers that eventually pushed the health system to make the change, he said. Much like what happened at MemorialCare, Sacco of Boca Raton Regional Hospital said the change was largely driven by patient dissatisfaction. In-hospital physicians must contract with the same insurers as the hospital so that patients aren't caught off guard with unexpected bills. Miller said he doesn't think bad PR alone would be enough to drive a hospital to adopt such a rule with physician groups—unless the hospital already has significant leverage. In a perfect world, such issues would be solved by having all parties sit around a table to make sure each provider in the supply chain is contracted with the right payers, said Steven Shill, national leader and assurance partner in the BDO Center for Healthcare Excellence & Innovation. But for now, he said it makes sense for hospitals to take the “play ball or you're not in our networks” approach, since they're likely going to field most of the complaints from patients. “I think the hospital is ultimately going to become the quarterback in many of these situations, because they have the most to lose,” Shill said. At least six states have passed protections against surprise billing. State laws do so by capping charges for out-of-network services, improving cost transparency, establishing an arbitration process and investing in research on the impact of surprise billing, according to the National Academy for State Health Policy. Congress is considering the No More Surprise Medical Bills Act of 2018, sponsored by Sen. Maggie Hassan (D-N.H.), which would, among other things, prohibit hospitals and providers from charging patients with employer-sponsored health plans more than the in-network amount for emergency medical care. Groups like the American Hospital Association and Families USA have pushed for federal legislation that would protect patients from surprise medical bills. If hospitals decide to require physicians to contract with certain insurers, they should be prepared for tough conversations, Sacco said, adding that both parties should approach the situation from the perspective of protecting the consumer. “We're trying to protect them, but we're also trying to be reasonable business partners as well,” he said. Correction: The CEO of St. Peter's Healthcare System is Les Hirsch. His first name was misspelled in an earlier version of this story.